Poland has warned that the creation of a multi-speed Europe could "break apart" the EU, as it heads toward a confrontation on rule of law. 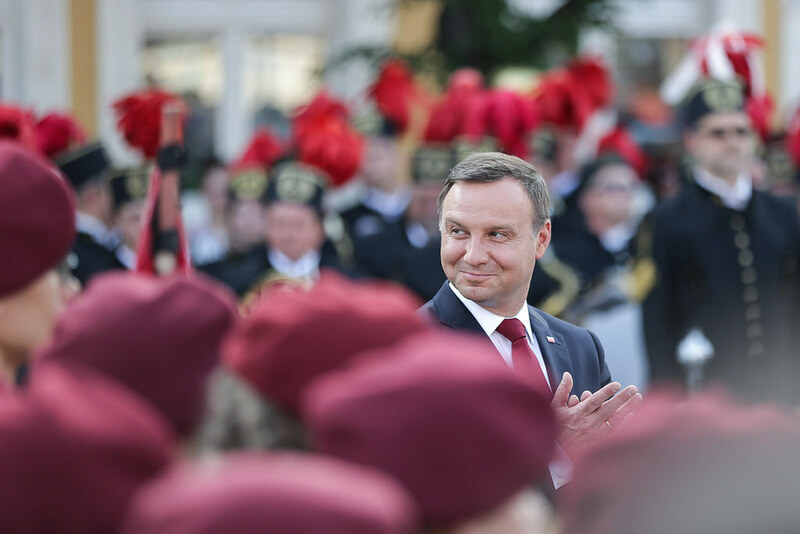 Polish president Andrzej Duda issued the doomsday warning at a congress in Krynica, a Polish town, on Tuesday (5 September). "Brexit is not a risk for the EU … A bigger threat is if the EU starts to break apart into a multi-speed union, into blocs where some are stronger and can decide about others. Then it would lose attractiveness not only for those in the B and C-classes, but also those seated in the A-class," he said, according to the Reuters news agency. 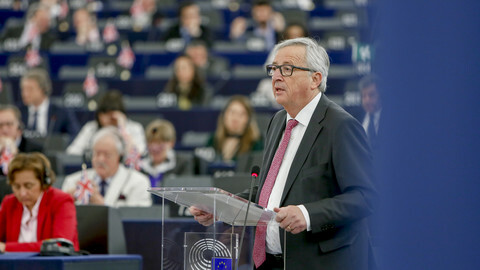 "The end result could be a divided EU that's not politically or economically viable, which may break apart the bloc," he added. 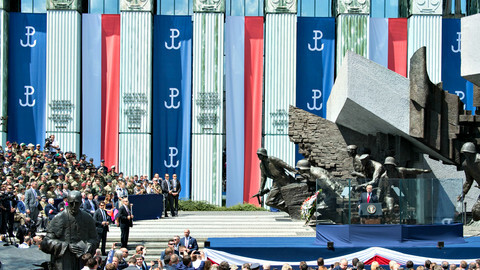 Duda also accused the European Commission of overreaching its powers in seeking to chastise Poland on judicial reform. 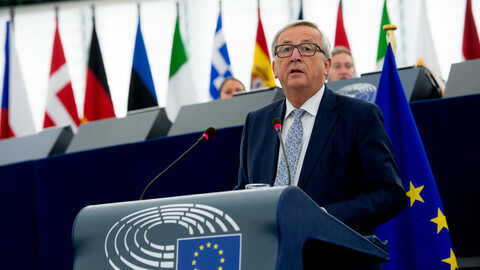 "There's no justification in EU treaties that allow the bloc to shape the judicial systems of member states," he said. "It's natural that EU institutions and representatives aim to extend their powers, but it's our job to say: 'Wait a minute - you're getting into fields where there's no grounds for your presence'," he said. Duda spoke after French president Emmanuel Macron said last week he favoured a "Europe of several formats". Macron said the eurozone, for instance, should have its own budget, and said he would make detailed proposals after the German election. Duda's comments on judicial reform come after the European Commission, also last week, threatened to seek sanctions against Poland on grounds that the ruling Law and Justice (PiS) party was trying to usurp control of courts and judges. 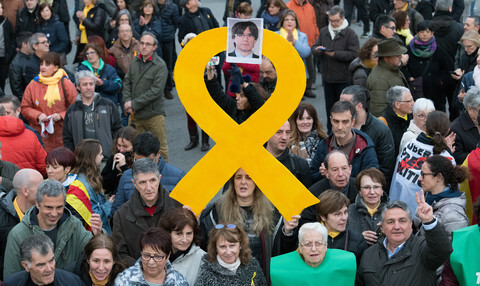 The Commission will ask member states on Wednesday to discuss the issue at a meeting of their EU affairs ministers in Brussels on 25 September, Reuters said. Amid Duda's talk of A, B, and C-class states, the sanctions could see Poland lose its vote in the EU Council altogether in what would be an unprecedented step. 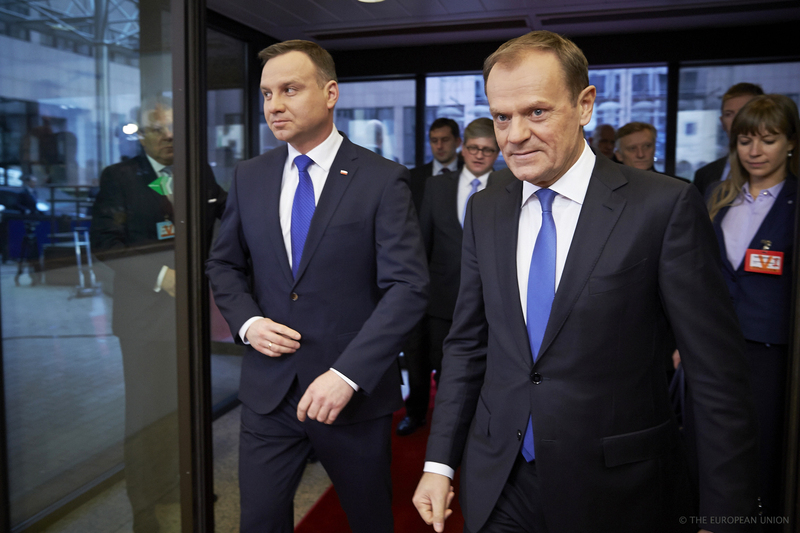 The Polish government is in conflict with the EU establishment on multiple fronts. The ruling PiS party has ignored an EU court order to stop logging in a primeval forest. The Commission has threatened to fine Poland for refusing to honour an EU Council vote on taking in asylum seekers. PiS has also accused EU Council leader Donald Tusk, a former Polish PM, of colluding with Russia and has called for WWII reparations from Germany. A new French plan to tighten rules on EU posted workers, such as Polish truck drivers, threatens to add another confrontation to the list. Polish foreign minister Witold Waszczykowski took a "diplomatic" approach to Macron's posted worker initiative on Tuesday. He said French and Polish labour ministers would discuss the issue because "as diplomats, we are obliged to seek a compromise". 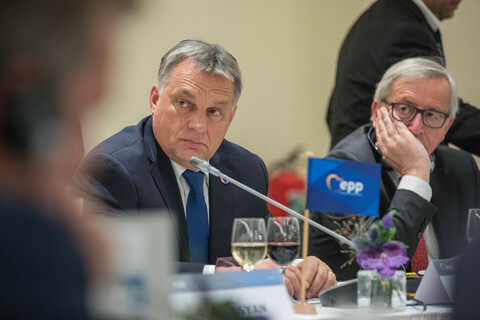 He added that Poland and its neighbours, the Czech Republic, Hungary, and Slovakia, were "eager to look for a positive solution, and only then will we be thinking of any way of blocking [the plan]". But Poland's deputy prime minister, Mateusz Morawiecki, was up for a fight. 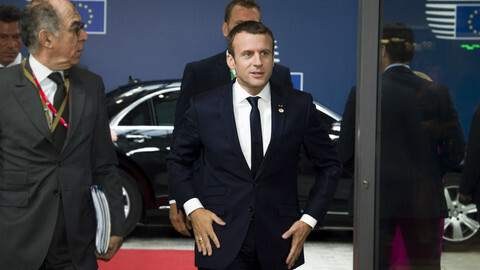 He told the Krynica congress on Tuesday that France and other wealthy EU states "discriminated" against Polish workers. "When we started to succeed, our EU partners began to place curbs on the free movement of services, calling it 'social dumping'," he said. 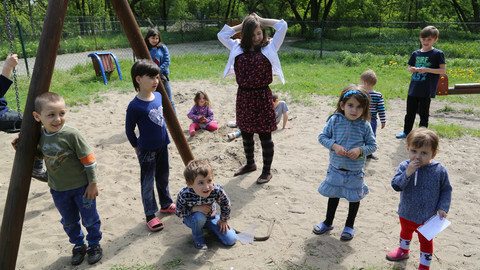 Waszczykowski, the foreign minister, earlier on Monday, said the WWII reparation claim was no joke. "We should sit down to serious talks with the Germans and together think about how to deal with the issue," he told RMF FM, a Polish radio broadcaster. He said the "material losses alone" that Nazi Germany inflicted on Poland were "close to $1 trillion [€840bn]". He noted that "in legal terms, the matter is ambiguous" and that PiS had not yet finalised its claim. But he added: "How can we deal with the fact that Germany's 1939 attack and unresolved postwar issues still cast a shadow on Polish-German relations?". "The fact is that Poland was destroyed during the war, terrible crimes were committed here, and we have received no compensation," he said. 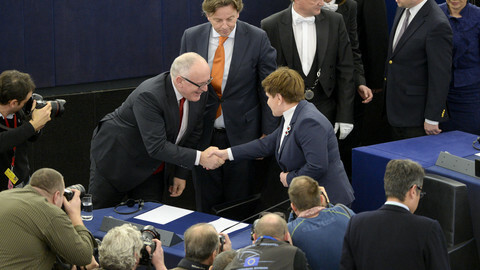 "There's no way we can drop the issue", Timmermans said, in an unruly EU hearing on Poland's alleged abuse of rule of law. The Polish government is preparing to claim World War II reparations from Germany, opening a new front in its clash with the EU establishment. While the principle behind the EU's decision to take action against Poland for rejecting its refugee quota is understandable, the move could have damaging long-term consequences while bringing absolutely no benefit at all. Commission chief to kick off the political season with a new vision for the future of Europe as he begins the last full year of his term.